January 13, 2011 - Gulfstream Aerospace Corp. test pilots and flight-test engineers recently made business-aviation history when they flew the Gulfstream G650 flight-test aircraft for the first time using only an electrically powered, fly-by-wire backup flight-control actuation system. 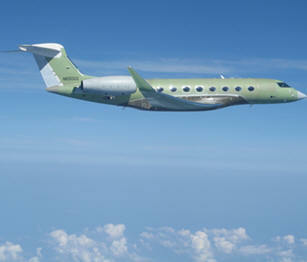 Gulfstream?s Serial Number (S/N) 6001 flew for a total of 3 hours and 33 minutes on Dec. 21, 2010. Test pilots Jake Howard and Gary Freeman along with flight-test engineers Bill Osborne and Nathaniel Rutland evaluated the fly-by-wire system in electric backup actuation mode for 2 hours and 20 minutes of the flight, performing five landings with the backup system engaged. ?The system performed flawlessly,? said Pres Henne, senior vice president, Programs, Engineering and Test, Gulfstream. ?There was no difference in handling qualities between the electrically and hydraulically powered modes.? ?It flew so well that unless pilots were told they were in backup actuation mode I don?t think they would notice,? said test pilot Freeman. Typically, fly-by-wire uses a third hydraulic system to provide redundancy in the event of a dual hydraulic system failure. However, Gulfstream?s fly-by-wire architecture uses electric backup hydraulic actuators (EBHA): electrically controlled actuators that are primarily hydraulically powered but offer electric power as a backup. A self-contained hydraulic reservoir and motor pump allow full operation should hydraulic loss occur. The G650 has an EBHA at every primary control surface (elevator, rudder and aileron) as well as the outboard spoiler. These provide enhanced safety and aircraft availability because of the two different power sources. The self-contained actuators also offer an advantage following extremely rare failure scenarios, such as a rotor burst. The Dec. 21 G650 flight began with evaluating the electric backup-mode handling qualities in one axis and then progressed to full evaluations in all axes (pitch, roll and yaw). The test conditions consisted of all flap settings at 10,000 feet for speeds ranging from 1.13 reference stall speed (VSR) to maximum flap extended speed (VFe). Cruise configurations were evaluated at FL280, FL350 and FL450 and the full speed spectrum. The pilots also initiated an emergency descent profile from FL450 to FL250. Additionally, they evaluated handling qualities in the landing configuration by making multiple offset approaches at Brunswick Golden Isles Airport in Brunswick, Ga.
Gulfstream Aerospace Corporation, a wholly owned subsidiary of General Dynamics, designs, develops, manufactures, markets, services and supports the world?s most technologically advanced business-jet aircraft. Gulfstream has produced more than 1,900 aircraft for customers around the world since 1958.